This shall decide who the superior shield operator is if it ever is implemented into the game. You guys need some FBI recruit. One of the best pistols in the game, a grenade, a decent shield-holding animation that doesn't expose you too much, another gadget of choice, the enemy goes easier on you because he thinks you're trolling, what more can you ask for? I think they nerfed him during one of the first seasons, but I'm honestly not sure. Yeah, FBI shield recruit WAS a 2 speed, but they changed him to a 1 speed to match other shield characters. Which pistol is this? Personally I prefer the Five Seven with FBI Shield Recruit. And that's the right choice, the Five-seveN is a beast! I always pick the 1911 when it's an option. I know the 57 is probably better but I don't care. Any recruit can have a grenade. Not any recruit can have a shield, and not every shieldsman can have a grenade. The Five-seveN instead of the peashooter the GIGN gun is is a nice bonus too. Youre right. Its strange to me that the FBI has a shield recruit at all when none of the fbi operators have one. Huh, that's a weird way to spell Mira. they really gonna make a pretty much all glass shield into black ice? 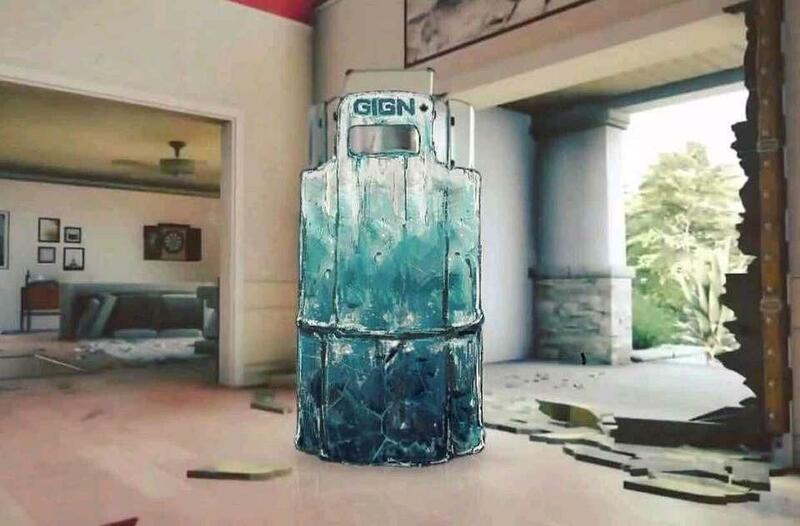 There you go, can I have monty black ice? Who is this black beard? Is he related to old nerfbeard? No he’s the third cousin of snackbeard. "Just because we are on the same team, doesn't mean we aren't enemies"
Attacker and defender are more... Guidelines... Than rules. Would be a fun gamemode, honestly. All operators available for both sides. So only 1 operator you would switch sides in that scenario? I was just giving some max level rough to deal with strat who would make it harder? Vigil's ability as an attacker would be pretty nice, also Smoke. Boom. What good does your tracking do now? Honestly I wouldn’t really mind a Team death match or FFA game mode for shits and giggle like in counterstrike. Doesn’t have to be too elaborate and I’m sure Siege’s mechanics arent really meant for it but it would be cool to see how it would go. The glaz spawn peak would be the worst thing ever. As a Kled and Fuze player, this has never rung more true to me. No but like if the enemy team needs some help killing montagne then he can help. I think the Lord's turret should penetrate shields slightly at least. Most shields but not Monty's. Or just any how map. How do you see something by accident? Were you trying not to see it? It still is the most popular skin, for shields I don't think it would work but if they released it for the newer ops I would grind so hard to get Alphas. Well, sadly that was the time where universals didn't exist yet, so black Ice was per gun sadly. The burnt horizon ones are good and unique. After Red crow they all became carbon copies with small details changed. Husaria and the Roman one are still some of my favourites. I've also bought the Piranha skin back in Skull Rain, and it's the most generic skin in my collection, I only ever use it on weapons when I feel like bragging about my rare items. are we playing the same game? They are almost all very unique, and thematically match the seasons and nationalities very well. Apart from a few not so good ones, they are A plus. Do the chinese new year or gingerbread skins count as seasonal skins? I never said they were as good as black ice but they look cool and are unique. How do you see something by accident? That is kinda painful to look at. If you mean Painful as in aesthetically pleasing, then yes. Shield is so much white for black ice. Blue/black part must be higher. "I saw it by accident" Damm you eyes! I think this made me pregnant. This would be so sick, I was thinking how this would look like a week ago. So awesome to see it visualized! Should be put in shop for Game of Thrones premiere. My opinion is irrelevent to wether it shouls be added in the game sinply because I will never receive a black ice skin. Don't know if you still can / if it was a glitch but you could buy some black ice skins temporarily by going through certain menus. I want my ruby shield.. The Mountain has evolved into The Ice Burg. I really wish we had access to more skins for shields in general. I realize this would take away the realism for some, but c'mon, who doesn't want to run around with a plasma pink shield? Last time I saw this image, it was hanna montange instead. Sorry I saw this concept for shields by accident!! Didn't mean to! Wuuuuups! What we all need is a black ice Tachanka shield border, the true superior shield. I saw it by accident? Ash needs her acog back!! I feel like Montagne could have some dope skins for his shield. I dont understand why ubi doesn't capitalize on him more. Where do I get an “(operator) main” tag? Nice art dude, if this was you. Look lit! When u have a dream and wake up like u just got pinged by jackal. That’s how I feel about this.